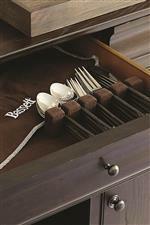 Keep forks, knives and spoons organized inside drawers. Piece made from silver can be easily scratched or dented. As you open and close drawers, items can be disheveled as well as damaged. Eliminate clutter and protect small, delicate items with a silverware tray. This elegant server will perfectly complement any of the dining items from its matching collection. This piece features unpretentious elegance with drawers, doors and wine bottle storage. 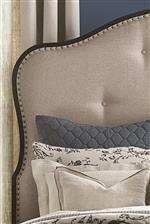 This piece drawers its inspiration from Philippe, Directoire and French countryside styles. 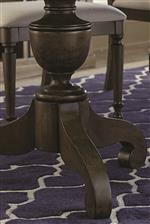 The Provence Server by Bassett at AHFA in the area. Product availability may vary. Contact us for the most current availability on this product.